Story by Andy Dappen. Photos by AD and Coron Polley. Arrowheads are funny. Sometimes they are right there at your feet looking you in the face, but you miss them. 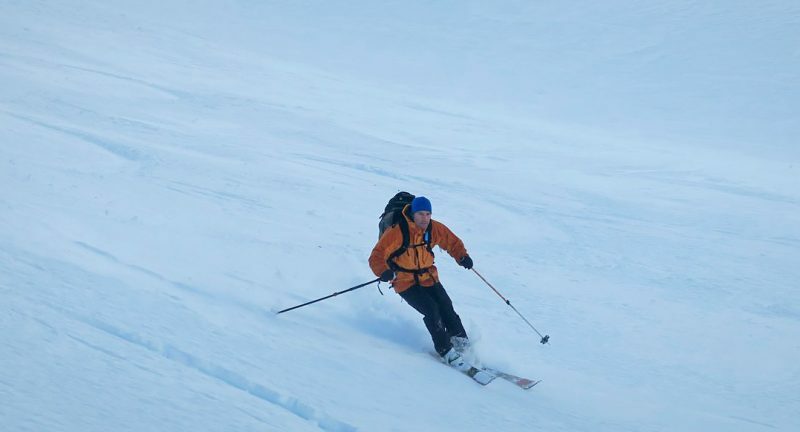 So it is with JimBo’s Arrowhead Traverse – a ski line that looks many in the face but is seldom seen. 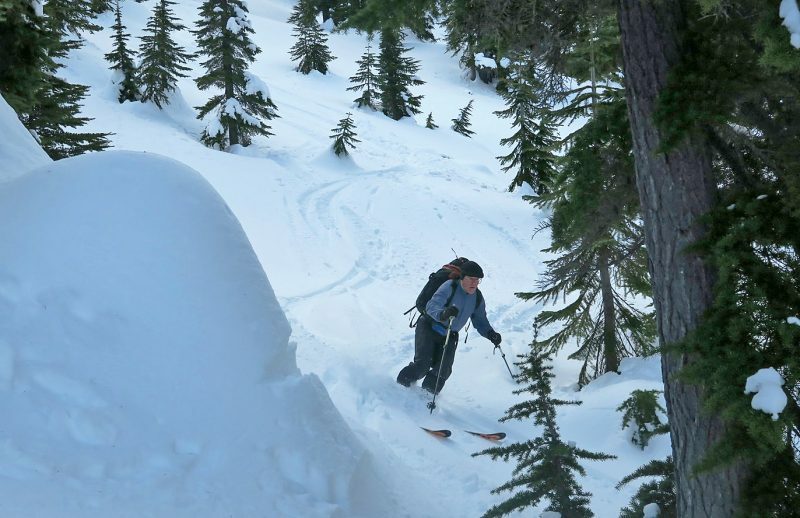 The problem is that most backcountry skiers coming to JimBo (Jim Hill Mountain) or Arrowhead Mountain come for the obvious lines described in several guidebooks – the big north-facing bowl below Jim Hill or, a few miles away, the steep northwestern glades of Arrowhead. JimBo’s Arrowhead traverses through this popular terrain but takes a closer look at things often missed—the glades below Jim Hill, the unnoticed satellite peak between the popular bookends, and the captivating East-Northeast Ridge of Arrowhead. 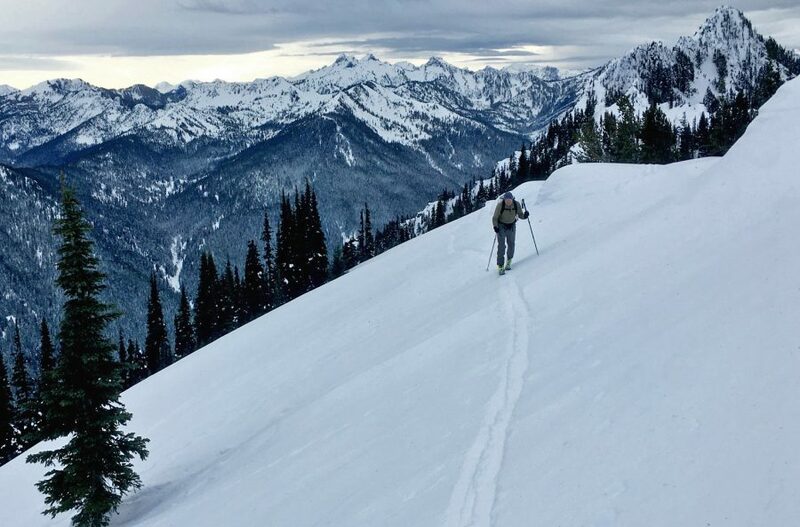 Starting at the Stevens Pass Nordic Center, follow one of the popular ski routes up Jim Hill Mountain by taking the trail to Lanham Lake, climbing the steep west-facing forests confining the lake to the north ridge of Jim Hill, and skinning the north ridge toward the summit. 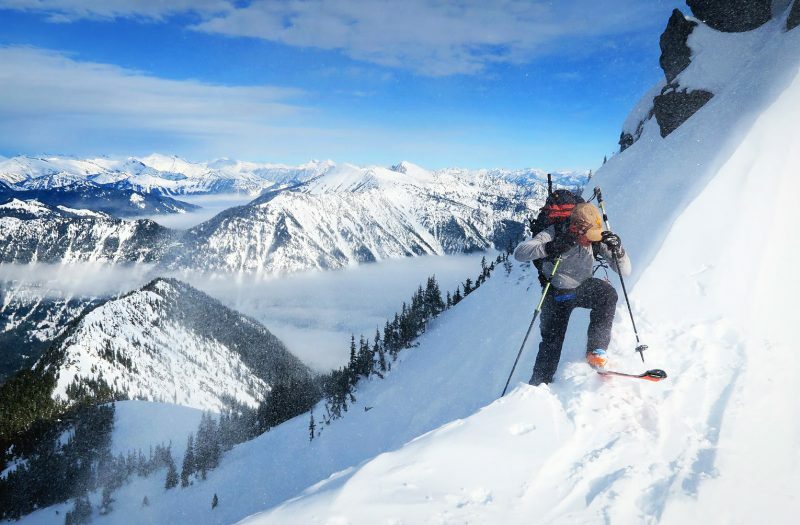 Most skiers don’t bother climbing the actual summit because the final short scramble up a rocky ridge is more the domain of climbers armed with ice aces and crampons. 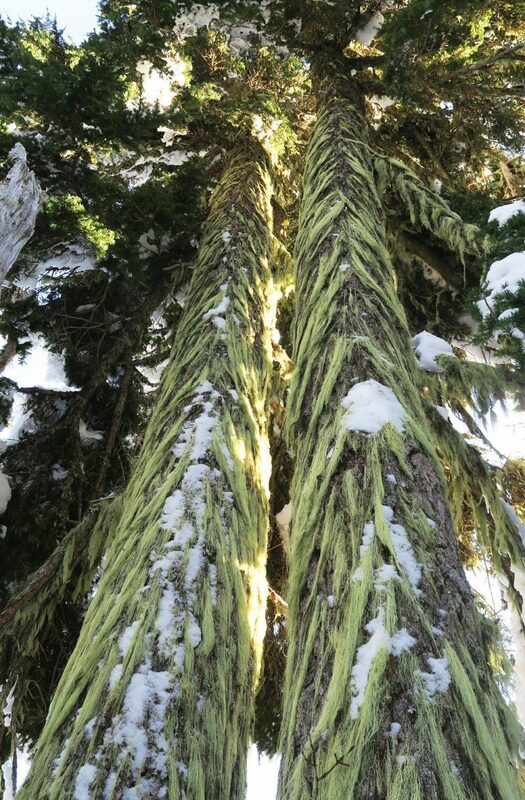 From the skiing high point of Jim Hill, the descent starts in the well-skied bowl but diagonals northeast into little-visited glades and old-growth forests offering hidden but surprisingly enjoyable turns through towering beautifully spaced hemlock trees. At the 4,900-foot level, the skins go back on and the route climbs eastward and upward to the 5,909-foot satellite peak between JimBo and Arrowhead. Even on a busy Saturday when the marquee peaks feel like a ski area’s sidecountry, this no-name satellite peak sits in obscurity. 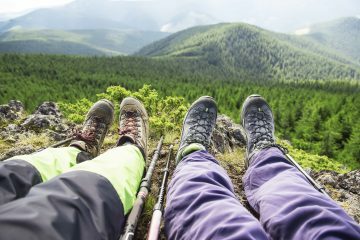 It offers a quiet perch to identify a thousand peaks in the Chiwaukum and Stuart ranges to the southeast, or in the Glacier Peak Wilderness and Entiat Mountains to the north. Skins strip off again and skiers now descend an east-facing ridge leading toward Arrowhead Mountain. Thinner vegetation makes the south side of the ridge easier to travel but the snow is likely to be either glazed and firm, or glazed and breakable. Brace yourself for challenging conditions. At the low-point of the ridge, terra cognita is re-found as skiers intersect the common route used to ascend Arrowhead Mountain. The masses will have stomped a well-traveled trail to the summit of Arrowhead. Compared to breaking fresh snow, the trail acts like an escalator taking one skyward with relatively little effort. On a busy weekend dozens of skiers will have skied the slopes adjacent to the uptrack. By heading east off the summit however, one is off the grid again. The descent follows a ridge that trends east for the first 1,000 vertical feet, then hooks northeast and drops another 2,000 vertical feet. The entire drop is a fascinating playground. The wind whistles over it, leaving all manners of wind rolls and wind lips to ski over or slice around. In places the slopes are beautifully gladed; elsewhere tree branches scratch at the face when skis are piloted between tree trunks. Perhaps most interesting is how the snow that is immediately north of the ridge crest can be powder while the snow immediately south of the crest can be crusty. Skiers can literally slice through powder as they turn skis right, then bust crust as they turn left. What a rush to ski a line that constantly changes between the blink of turns. Eventually the east-northeast ridge system intersects an old logging road at 2,800-foot level. The road is old and filling in with saplings but it offers a reasonable escape from what would otherwise be an exhausting and exasperating thrash through a tangle of second-growth trees. After a mile, the overgrown road passes a closed gate that has excluded motorized travel for a generation. Past the gate the travel is easy and a quick shuffle on skinned skis leads to the shuttle car waiting along the Whitepine Road near the Cascade Meadows Church Camp. There are times during this traverse that a skier might wonder whether every arrowhead should be picked up. When a tree branch slaps him in the face, for example, he may wonder “Should I have bothered with this tour?” When it’s all said and done however, this route offers all manners of surprises that make it challenging and interesting. Once completed, few backcountry skiers will be disappointed that they added this arrowhead to the collection. Vertical Gain: 5,650 feet. Vertical Loss: 6,350 feet. Hazards. The route climbs and crosses considerable avalanche terrain — wait for a stable snowpack to take it on. Navigation. Skilled navigators can complete the tour with map, compass, and altimeter. Average navigators will want those tools along but will benefit from a GPS unit with important waypoints noted. Map and Waypoints. See the attached map. Access. Leave from the Stevens Pass Nordic Center by driving 29 miles west of Leavenworth and turning left at milepost 70.3 and following the ‘Upper Mill Cut’ off the divided highway to reach the entrance of the Nordic Area. If coming from the west, drive 5.7 miles east of Stevens Pass before turning right into the Nordic Center. Backcountry skiers can park in the outer lot (the lot farthest from the Nordic lodge) without a pass and without paying a fee. Shuttle Vehicle. 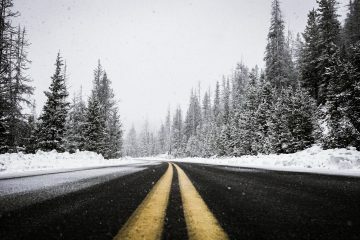 Leave a shuttle vehicle along the Whitepine Road by driving Highway 2 west of Leavenworth about 20 miles and turning south onto the road at milepost 78.4. In winter this dirt road is plowed about 1.5 miles to the Cascade Meadows Church Camp. Park in any pullout near the end of the plowed road. Be sure to park in a way that other vehicles can still turn around at the end of the plowed road. No permits, passes or fees are required. Leave It Better Than You Found It: This should be every outdoor user’s goal. Pick up trash left by others and leave no trash of your own.